The basic principles of health and safety legislation rely on an understanding of activities and practices which might cause harm (hazards), and what might happen (risk) if such activities and practices are not adequately controlled. The process of identifying and managing risk relies on a basic understanding of the relationship between hazards and risk (Box 3A). Hazard – Something with the potential to cause harm. Risk – The likelihood that the hazard will cause harm. 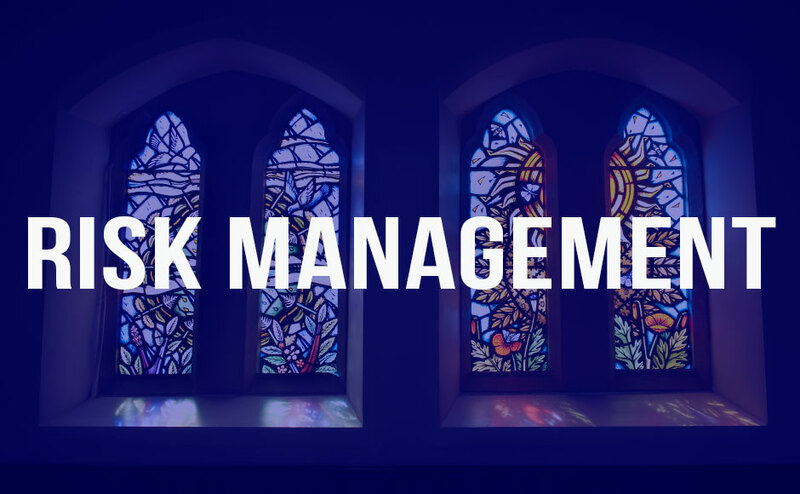 Risk management is the process of identifying hazards and managing risk within your congregation. The process of risk management is relatively straightforward. It involves identifying potential hazards and evaluating these hazards to determine if they are likely to cause harm. The high-risk response to crossing the road would be simply to walk out when a gap appears in the traffic. The low-risk response would be to use the traffic lights and wait until the lights turn red. However, there is a final option, which is to avoid the traffic altogether by using the footbridge or tunnel nearby. This is known as the process of elimination and is an important consideration in health and safety risk management. The Health and Safety at Work Act 1974 requires that employers ensure, as far as is reasonably practicable, the health, safety and welfare at work of all employees. A similar requirement also extends to those who are not employed but may be affected by the employer’s activities. Although this does not explicitly state that risk assessment must be carried out under the premise of the Health and Safety at Work Act 1974, the employer must identify what might have a detrimental effect on the health, safety and welfare of employees and others, and put appropriate preventable measures in place as far as reasonably practicable. Employers must make a balanced decision about the hazard and the likely severity of risk and the consequences or outcome of doing nothing against the time, inconvenience and financial costs of controlling or removing the risk. The decision taken by employers can be demonstrated by undertaking a risk assessment, taking into account other relevant legislation, approved codes of practice (ACOP) and guidance notes. Significant risks are those not trivial in nature and capable of leading to real risk to health and safety which any reasonable person would appreciate and take steps to guard against. The Management of Health and Safety at Work Regulations 1999 (The Management Regulations 1999) describe the requirement for risk assessment in the workplace. The regulations state that every employer shall make a suitable and sufficient assessment of the risks to health and safety to which their employees are exposed at work. Every employer must also make a suitable and sufficient assessment of the risks to the health and safety of anyone not in their employment arising from, or in connection with, the employer’s conduct. You have involved your employees, and anyone else who might be affected, in the risk assessment process. The Management Regulations 1999 identify two particular types of workers that employers must pay special attention to whilst carrying out risk assessments: children and young persons; and new and expectant mothers. A child is defined as a person not over compulsory school age, in accordance with the Education (Scotland) Act 1980 as amended. In practice, a child is defined as anyone under 16 years old. A young person is defined as anyone under the age of 18 but older than 16 years old. The Management Regulations 1999 require employers to consider several factors in their risk assessments when employing young persons (i.e. anyone under 18 years old). These include the inexperience, lack of awareness of risks, and immaturity of young persons, workplace and workstation layout, exposure to physical, chemical and biological agents, use and handling of work equipment, work process and activities, and health and safety training. The Health and Safety (Training for Employment) Regulations 1990 give students on work experience programmes and trainees on training for employment programmes the legal status of ‘employee’, therefore protecting them under health and safety legislation. Similarly, young people in work experience placements arranged by schools, colleges or local authorities in most cases undertake relevant training and are therefore protected. The Management Regulations 1999 require that employers carry out risk assessments for any specifi risks to female employees of childbearing age, and new or expectant mothers and their babies. The risk assessment does not have to be a separate risk assessment it can be undertaken as part of an overall risk assessment of the workplace. Congregations employing young persons or new or expectant mothers should seek additional advice on health and safety from the Church of Scotland General Trustees, and on employment law from the Church of Scotland Law Department or other suitable resource. The requirement for employers to undertake a risk assessment is outlined in the Management Regulations 1999. However, a number of other specific requirements relate to health and safety risk assessments covering subject-specific risks referred to in other legislation. These are described in Box 3B. Further advice regarding subject-specific risk assessments can be obtained from the Church of Scotland General Trustees. The Management Regulations 1999 describe the requirements for employers to undertake a suitable and sufficient risk assessment of their work activities. However, neither the Management Regulations nor any subject-specific legislation explicitly tells employers how to undertake risk assessments. A risk assessment is the process of identifying the hazards to which employees may be exposed, and assessment of the risk of these hazards causing harm. When these hazards cannot be removed, suitable control measures should be put in place to reduce the likelihood of harm occurring. 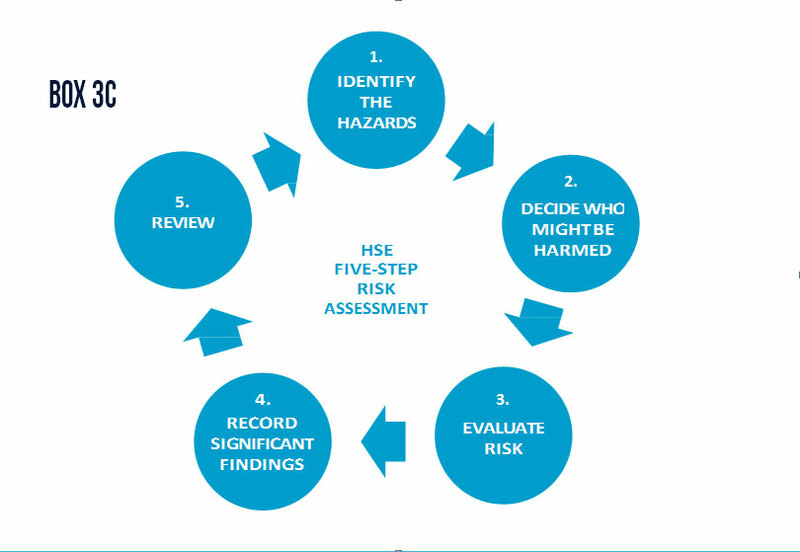 The HSE has produced a widely accepted and easy to follow five-step model for carrying out risk assessments in Box 3C. A suitable and sufficient assessment of all manual handling operations must be undertaken, taking into account the tasks, loads, working environment, individual capability and any other factors that might affect manual handling operations. Employers must undertake a suitable and sufficient analysis of all workstations used by DSE users (employees) and operators (self-employed). Employers must make a suitable and sufficient risk assessment of all work activities which might expose an employee to any substance hazardous to health. PPE should only be used as a last resort when all other risk control alternatives are unsuitable, including elimination, engineering controls or safe systems of work. Employers must make a suitable and sufficient risk assessment where employees are liable to be exposed to predetermined noise exposure levels. Please see separate section on fire safety. Employers must make a suitable and sufficient risk assessment of the likely exposure of employees to lead. Please see separate section on asbestos. Certain criteria are to be met for anyone working at height and undertaking risk assessments under the Management Regulations 1999. 3.8 Who Should Carry Out the Risk Assessments? The charity trustees of the congregation are responsible for ensuring that suitable and sufficient risk assessments are carried out, documented, actioned and reviewed. It is recommended that the appointed Health and Safety Administrator should be responsible for ensuring that risk assessments are carried out properly – but they will not be responsible for actually undertaking the assessments themselves. However, all charity trustees must be assured that risk assessments have been carried out and that the risk assessments reflect the hazards and risks within their properties and the activities undertaken within. Risk assessments should not be carried out by just one person. This will likely result in significant hazards being missed or incorrectly evaluated. A small group representing a variety of property users should be established to undertake risk assessments. Remember, it is also important to speak to all employees when carrying out a risk assessment. The Health and Safety Administrator will be responsible for reporting the outcome of risk assessments to the charity trustees. Risk assessments should be carried out for all properties for which the charity trustees are responsible and all the activities occurring within these properties.This does not include the Manse, unless the Manse is used as a place of work by employees. Correct identification of hazards is a very important part of any risk assessment. It might be useful to organise or separate risk assessments by dividing the process up into different locations, rooms, processes, activities, etc., depending on property size and use. For ease, hazards can be classified into five main groups (Box 3D). A visual inspection of the areas or activities to be risk assessed is a good place to begin identifying potential hazards. It might also be useful to look at other relevant sources of information, including previous risk assessment records, operating procedures for equipment, training records, accident/incident records, information from manufacturers and suppliers, and health and safety inspection reports. It is important to speak to those directly involved with providing specific activities to ensure that all significant hazards are identified. Extensive information on hazard identification is available from the HSE website, including access to legislation, guidance documents and ACOP. The risk assessment must reflect all those who may be at risk from the hazards identified from stage one. It is good practice to ask employees what they think the hazards are in their workplace and how they could be affected. They might notice things that are not obvious and have practical ideas of how to control risk. It is useful to speak to representatives from specific groups who use your properties regularly. For example, if halls are used by dancing or keep-fit groups, it is important to speak to the group organisers to ensure that all potential hazards have been identified. Some congregations share their properties with other organisations on a permanent basis. For example, a congregation might have a long-term tenancy agreement to let office space to an external organisation. It is important to consider how your work and other activities affects them and how their work activities affect you and your employees. It is useful to have regular conversations to ensure that adequate controls are in place and that any risk-based controls are working. When all potential workplace hazards have been identified, the next step is to evaluate the risk of these hazards actually causing harm. Removing the hazard is always the preferred method of control. For example, all portable electrical equipment is visually inspected regularly and physically inspected annually. Reduce level of risk by substituting the hazard with a less hazardous alternative. For example, replace a cleaning chemical which is an irritant with a non-irritant variety. Involves isolating the hazard from anyone who could be harmed. For example, ensure that smoke control doors remain closed or store flammable liquids in a locked container and restrict access to the room. Policies and procedures implemented to allow people to work safely – for example, a lone working policy, food safety management system, or emergency evacuation plans. Training and supervision is also an important administrative control. Only after all of the above measures have been considered and tried should PPE be issued. A number of tools have been developed to help organisations undertake a risk assessment and evaluate risk. A risk matrix looks at the severity of a hazard and the risk (likelihood) of the hazard occurring. 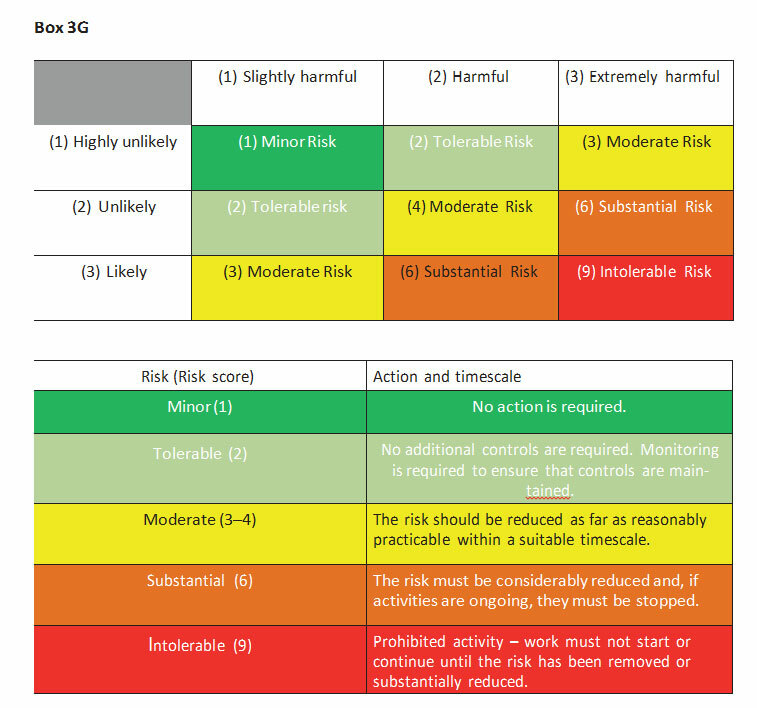 The severity and likelihood are multiplied to give an overall risk score which can help organisations manage and prioritise hazards (Box 3G). It is not compulsory to use a risk matrix when undertaking a risk assessment. It is acceptable to use personal judgement to decide which hazards are significant and when additional controls may be required. It is important that those carrying out the risk assessment fully understand the risks associated with the activities or the use of the buildings being assessed. Individual experiences, knowledge, attitudes and competence can result in hazards being allocated higher or lower risk scores than are suitable for the situation. It is also important that, if risk scoring is undertaken, focus is placed on the hazards and risk and not on the actual final risk score. Remember, risk scoring is a useful tool to help you evaluate risk; it is not a tool used to control hazards. If a suitable risk assessment was carried out before the task was started, it is apparent that this would have represented an intolerable risk and the activity should not have started (been prohibited) until the risk (asbestos) was removed. The congregation have reasonable and practical control measures in place to make sure that members of the congregation are not at risk of slips, trips and falls when entering or leaving the church. Appropriate action must immediately be taken to reduce the risk of tripping so far as is reasonably practicable. This might include the use of cable covers or cable mats to sit over the cables when in use. It is important to keep a written record of risk assessments and the decisions made about how to control identified risks. written record and the Church of Scotland requires all congregations to provide evidence that suitable and sufficient risk assessments have been carried out. 3.18 What Should be Included in the Risk Assessment Document? There is no prescribed format for a risk assessment document. However, it is necessary to record significant hazards identified, how people might be harmed by them and what has been put in place to control the risks. The risk assessment record should be simple and focus on controls. It is possible to refer to and list any policies, procedures or relevant information that demonstrate risk control within your risk assessment. It is important, once risk assessments have been properly documented, that these are communicated to all employees and anyone else who might be affected, such as volunteers, contractors and visitors. Risk assessments must be reviewed regularly. For very low risks, this means an annual review. However if control measures have been implemented, it might be necessary to review these more regularly. It is especially important to review risk assessments in cases of an accident or near miss, significant changes to procedures or equipment, or changes in the law. For any moderate, substantial or intolerable risks, continual review of risk assessments until risks have either been eliminated or controlled to a tolerable level is necessary. Working at height remains one of the biggest causes of fatalities and serious injuries across the UK. The main causes include falls from ladders and through fragile surfaces. Unfortunately, a number of serious injuries and even fatalities have occurred in several Church of Scotland congregations in recent years as a result of working at height. It is essential that charity trustees of congregations recognise the significant health and safety risks that working at height has for employees, volunteers, members of the public and contractors in particular. What does ‘working at height’ mean? The Work at Height Regulations (2005) are very prescriptive and require employers, the self-employed and any person who controls the work of others to appropriately assess and adequately control any work undertaken at height. appropriate selection of equipment to be used and procedures for emergencies and rescue. Consideration must also be given to the working environment and, in particular, the weather. Anyone involved with planning, organising, supervising, arranging equipment and working at height must be competent to do so. The risks of working at height are assessed and appropriate work equipment (including PPE) is used. Special consideration must be given to working on or near FRAGILE SURFACES. It is necessary to ensure that nobody passes across or near, or works from or near, a fragile surface, unless it is reasonably practicable to do so under appropriate conditions. If it is not reasonably practicable to do so, suitable and sufficient platforms, coverings, guardrails or similar means of support must be provided and used. In addition, suitable and sufficient measures must be taken to minimise the distances and consequences of a fall. If there are any fragile surfaces within any congregation properties, prominent warning notices must be affixed at the approach to these so that people are aware of the risks of working on or near the area. All equipment for working at height must be properly inspected and maintained. It is also important to put in place suitable precautions to prevent injury from falling objects when working at height. This might involve stopping people accessing areas underneath until work is complete. The Work at Height Regulations (2005) set out a hierarchy of measures, which must be considered when carrying out a risk assessment for any work activity involving working at height. Preference must be given to the first measure of the hierarchy, only moving down the list if each measure is not reasonably practicable (Box 3AA). Undertaken using appropriate collective measures to prevent falls (such as guardrails and working platforms) before other measures which only mitigate the distance and consequences of a fall (such as nets and airbags) or which might only provide personal protection from a fall. Anyone required to undertake any work at height must be appropriately trained. Training must include use of any equipment required to undertake the job and method of undertaking the job safely. It is also important to consider individual capabilities for working at height. Employees and anyone else required to work at height must report any issues (including health issues) which might affect their ability to undertake their work safely. For example, if someone suffers from recurring dizziness, epilepsy, a heart condition or severely impaired joint function, he or she should not be allowed to work at height (Box 3E). a complete blanket ban on all working at height activities is impracticable and disproportionate and we therefore recommend that low-risk work involving the use of small ladders and stepladders can be carried out safely, as long as the principles discussed in this toolkit are considered and followed (Box 3E and Box 3AA). Ladders and stepladders can be useful pieces of equipment in any congregation building if they are used safely for light work of short duration. It is important to consider the task, person and working environment before any task is carried out, as well as to ensure that ladders and stepladders are fit for purpose – checked before and after use for damage and only used following the manufacturers’ instructions. The HSE has produced a number of excellent resources on the safe use of ladders and stepladders. INDG 402 Safe Use of Ladders and Stepladders – An Employer’s Guide (2005). Alternatively, please contact the Church of Scotland General Trustees for a copy. at height and have sufficient information to make an informed choice to allow the use of such equipment in their buildings. Such equipment must be fit for purpose and anyone using it must be competent and fully trained. It is likely that mobile platforms and scaffold towers will require annual inspection and maintenance (not including the regular checks undertaken by the congregation) to ensure that they are safe to use. However, the Church of Scotland recommends that such equipment is not purchased and used by congregations, and that any high-level work requiring its use should be undertaken by a suitably qualified external contractor. Finally, it is important to ensure that adequate insurance provision is in place for the use of mobile platforms or scaffold towers. Asbestos is a serious public health and safety concern and legislation to protect the health of employees has been in place since 1931. Despite regulatory controls becoming stricter over the past twenty-five years, around 4,500 people die each year in Great Britain from asbestos-related diseases. Asbestos products themselves are harmless when maintained in good condition. Risk to health occurs when asbestos fibres become airborne and are inhaled. This can happen when Asbestos Containing Material (ACM) becomes damaged or disturbed or is not well maintained. Although it is possible to see ACM in its processed format, such as in AIBs or asbestos pipe lagging, hazardous airborne fibres are microscopic and cannot be seen by the naked eye. 3B1 What are the Main Types and Uses of ACM? ACMs were used in various parts of buildings and were previously seen as useful construction materials because of their thermal and fire-retardant properties (Box 3BA). Sprayed asbestos (limpet) Fire protection in ducts and to structural steel work, fire breaks in ceiling voids etc. Although it is common to find ACM in many congregational properties, buildings constructed after 2000 are unlikely to contain asbestos materials. However, where installed recycled plant, equipment or machinery is present, it is still important to check and be assured that no ACM is present in your properties. Examples of where ACM is likely to be present in buildings are provided at the end of this section of the toolkit. We have included photographs published by the HSE as a visual aid. Where uncertainty exists over whether a particular material in a building is an ACM, it must be assumed that it is until confirmation is received from a competent person that it is not. Who is responsible for managing asbestos in congregational buildings? CAWR is another prescriptive regulation which includes a number of actions to be taken by duty holders to ensure suitable and sufficient management of all ACM within properties. As with other legislation, duty holders will normally be the charity trustees for the congregation: i.e. the Kirk Session, the Financial Board (if any), Congregational Board, Deacon’s Court and Board of Management and all members thereof. The actions required to comply with the CAWR could be delegated to one individual, such as the Congregational Health and Safety Administrator. However, this individual must report back their findings to the trustees of the congregation. The CAWR only apply to non-domestic premises and the Manse is therefore normally excluded. However, if undertaking an asbestos management survey or where asbestos might be present, it is best practice to include the Manse in the asbestos management plan. 3B3 What do the CAWR Require us to Do? Duty holders have the responsibility of taking all reasonable steps to fiout if ACMs exist within church buildings. There are two methods of identifying ACM within buildings. A competent person (surveyor) can carry out an asbestos survey. The HSE identifies three main types of asbestos survey, as outlined in Box 3BB. Type 1 – presumptive survey This is a non-sampling survey. There is no positive identification of ACMs and materials are only excluded if the surveyor is confident that they are not ACM. All other materials are presumed to be ACM. Type 2 – sampling survey Representative samples are checked for the presence of ACM. The condition of any ACM should also be noted and reported. Type 3 – full access sampling and identification survey Includes assessing normally inaccessible spaces for the identification of ACM. If a competent surveyor is appointed to undertake an asbestos survey, the Church of Scotland recommends that a Type 2 survey be commissioned, as these are more robust and thorough. The second method to determine if ACM is present is to look at building plans, drawings, plant installation instructions and other relevant information to identify likely sources of ACM. It is also necessary to inspect all reasonably accessible areas to determine if any materials are likely to be ACM. Personal judgement can determine if ACM is likely to be present. A professional asbestos analytical company could also sample specific materials for the presence of ACM. However, it is important to be confident and competent in any decision to undertake this method of identifying ACM. Under no circumstances should anyone, including general surveyors or maintenance contractors, attempt to, or undertake, any sampling of ACM or any suspected ACM. This must only be undertaken by appropriately trained and competent persons. Please seek specialist independent advice or contact the Church of Scotland General Trustees for further information. Where confidence exists that no ACMs are present within a property, it is necessary to record the date of inspection, who carried it out, and a statement that no ACMs are present within the building. No other action need be taken under the CAWR. Provide information on the location and condition of any suspected ACM to anyone who is liable to work or disturb them. There is no prescribed format for what the asbestos management plan should look like, but it must reflect all the points noted above. It might also be useful to include photographs of any suspected ACM in the management plan. This plan must be reviewed regularly and all control measures (such as monthly inspections) included as evidence to show that these have been done. All materials containing asbestos must be labelled and notices placed on access doors. If the ACM is in good condition, it might be possible to visually inspect this regularly, recording the dates and times of the inspection to ensure that the ACM has not deteriorated. If you suspect that any ACM is in a poor condition, expert specialist help must be sought as soon as possible. Access should be prevented to any area where ACM is damaged or in poor condition until appropriate expert advice is sought. The management plan must be reviewed regularly (at least twice yearly) and if any ACM is accidentally disturbed. If any ACM is present in your properties in good condition, it is acceptable to leave it in place and monitor its condition regularly. The ACM should only be considered for removal if it is damaged or in poor condition, as the risk of inhaling asbestos fibres is increased. It is illegal to removal ACM from a building unless this is undertaken by a HSE-licensed asbestos removal contractor. Expert advice must be sought before a decision to remove any ACM from your building is agreed. Where ACM is present within church properties, it is reasonable to expect that some maintenance in these areas will be required. Due regard must be given to the contents of the asbestos management plan, especially to the location and condition of any suspected ACM. The asbestos management plan must also be made available to any tradesman or contractor working in your buildings – especially if the work will involve hammering, drilling or sawing. Anyone working on ACM must be suitably trained and supervised. If possible, work should be planned so that any suspected ACM is not disturbed. If work must be carried out which might disturb ACM, exposure to asbestos fibres should be prevented. Where this is not reasonably practicable, any exposure should be reduced as far as is reasonably practicable using appropriate control measures and by having management systems in place. Emergency procedures should also be devised in case asbestos is accidentally disturbed and contaminates areas where employees or members of the public frequent. Additional advice can be sought from the HSE website. Expert advice should be sought from the HSE, independent asbestos contractor or the Church of Scotland General Trustees before any maintenance work on or near ACM begins. Inspect your buildings and determine if ACM is present, or is likely to be present. If in doubt, assume that materials are ACM until otherwise confirmed. Record the location, quantity and condition of each section of ACM. Assess the likelihood of any ACM releasing fibres into the air. If ACM is in good condition, record this. If it is broken, record this and describe how the risk will be controlled. For example, prevent access to areas where ACM is present and arrange for ACM to be removed. Written records must be kept. Prepare and maintain an asbestos management plan. Ensure that ACM is labelled and that warning notices are in place at access points. Ensure that copies of the asbestos management plan are available for all contractors and others carrying out maintenance. Review the asbestos management plan at least twice yearly and especially when a release of asbestos fibres is suspected. Prepare and implement appropriate emergency procedures to be followed in the event of an accidental release of asbestos fibres.